Any discussion of women’s experience in technology companies eventually turns to some discussion of men’s “bad behavior” — and I’m not talking about the awful prevalence of sexual harassment. Women in our Women in Tech research commonly complain about “being invisible” because of the way they are talked over. They don’t like being “barked” at by male engineers. They do value an on-task, straight-talk culture. But the line between direct, curt language and “barking” can be very thin. I was reminded of this because of a recent complaint by colleagues of a tech worker to their boss that the employee was treated rudely by a visiting professor. The professor was informed about the complaint and since the interaction was observed by another colleague asked for his opinion countered. The colleague’s view was, “No, you were definitely not rude. You were simply very on-task and direct — they might not have been used to that.” This case started me thinking about the different meaning of rude playing out at work. Add to cultural differences this interesting study in the Journal of Psychological Science. The study found that women have a lower threshold for what constitutes offensive behavior than do men. If women perceive more behaviors as inappropriate, then they will see inappropriateness more often in themselves and in others. The authors argue that women apologize more often because they see their own behavior as inappropriate. And of course, if women see more offensive behavior in general, they will judge others to be offensive, rude, arrogant, insensitive, and the like. If diverse teams composed of women, men, and people from diverse cultural backgrounds are going to work well together we need a way to raise up how we perceive behaviors. We can then deal with them consciously and directly within teams and between colleagues. To help this exploration, I asked my student teams to try an exercise. The teams are composed of people from multiple countries where interpersonal styles can be quite different. As team bonding exercise, I asked these newly-formed teams to individually write “rude” behaviors on sticky notes and share them with teammates for discussion. We then discussed it as a class. Everyone thought it was crazy fun. Here’s what we learned in discussion. I asked the group to share anything surprising. One team shared that someone thought not saying hello was rude. Through discussion we discovered that saying hello is hiding one of the most basic human needs: acknowledging our existence. When we say hello, we look each other in the eye. Implicitly we acknowledge that the other is present, is different from a table or another object in the room. Dogs get it — any other dog attracts them. They want to go play (at least mine does), they want to find out who is in their world (sniff), they get ready to interact. I always wondered why people who are hiking the same trail always say hello. I think it is the same reason — we recognize each other’s humanness and existence. “Hello” says I’m going to take your existence into consideration when I act. Being a team means recognizing the humanness in each other — and treating each other as a person. This seems core to much of what makes a behavior rude. I had to learn about this the hard way from a grocery cashier who objected to me talking on the phone and not interacting with him. When I’m out and about in the world I tend to be hyper focused on who I’m talking to or what I’m thinking about. After being admonished by this cashier, I went home and decided that for any human being I touch I need to look them in the eye, respond to what they are asking, and —for cashiers and wait staff — thank them. I think we call this common courtesy. Maybe we need more of common courtesy in our teams. A team is focused on getting work done. Group time seems wasted when someone’s unfocused talk holds everyone hostage until the speaker is done — that is rude. Too much talk by one person simultaneously implies that they are more important than others and leaves no time for others to talk as equal partners. There is a dynamic tension between common courtesy and right-sized talking. Those of us who talk too much, need to talk to figure out our ideas, or clown around for fun and connection need to manage our words. In Contextual Design, we instituted team techniques to move people along. For example, teams can get lost trying to agree on a definition. So, we give them a 2-minute rule. Figure it out in two minutes or write down multiple words that represent your meaning and then move on. Getting the exact word is usually not critical to productive design thinking. When working together we all must self-modulate so I taught my students this way to think about airtime. Set three minutes as a reasonable amount of time to talk about any idea. (Try a time keeper to get used to it.) Then do the math: in an hour meeting of 10 people there are 20 talking opportunities — two minutes per person. Try it for a while to raise consciousness! Talk management helps talkers self-modulate and non-talkers step forward. Different meeting types also have different rules. A brainstorm expects people to shout out ideas — solutions — not provide the whole justification or back story to the idea. A brainstorm has no time for you to work out your ideas in front of the group. When this happens everyone gets frustrated and feels held hostage. Having rules about talk management mitigate against interruption. If all talk is short and to the point no one gets impatient. A group of young lawyers had a very hard case and partners who weren’t great managers. There was a lot of work and they were falling behind. Some of the work was straightforward and some was synthetic and strategic. Together the associates decided that most of them would do the straightforward work. Then they passed it onto one associate with a strategic mind. He got to pull it together and ask them for more research or other work. The team decided that the strategic associate could direct what they did — and they got it done. Compare that approach to if instead the strategic associate took over and told everyone else what to do. Then he would have been seen as arrogant, rude, putting himself above the others, and denying that everyone is worthy and of value. So often in tech we talk about arrogant men. But if we — regardless of gender — are the noisy talkative ones, natural leaders, or fastest thinkers we have the harder challenge. Unless we want to think every thought, do all the work, and produce every deliverable by ourselves we better start self-modulating and finding the valuable contribution in others — especially new people. Getting work done requires all kinds of skills. Use everyone for what they are good at! There is nothing that pushes a person away faster than presuming you know them when you haven’t spent the time to find out about them. We all walk the line between asking too much about our differences (emphasizing how much they are “not like me”) and assuming we know something just because we have, for example, eaten in an Indian restaurant. Politics is particularly sticky especially today. Coming from a liberal state like Massachusetts or Maryland, I’ve witnessed speakers and groups of people assume that everyone present is liberal. Nothing angers my Republican friends more than a speaker’s comments assuming that everyone there agrees with a liberal stance. Assumptions about others so often comes off like a “devalue push”. It is a close cousin to “gossip,” which the students also listed as rude. All of this behavior emphasizes how others are “not like me”. So take the time and get to know your colleagues. Hear their unique story — it will make working together smoother and more fun! 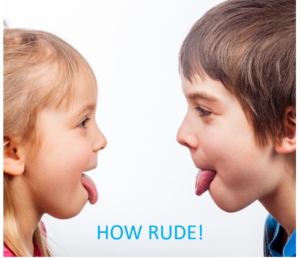 I asked my 6-year old grandson what it means to be rude. “Not being nice,” he said. When we look at what behaviors my students listed they all boil down to treating every person as wonderful, unique, and human. In other words be nice! We all come from different family cultures, traditions and acceptable behaviors. Culture and acceptable behavior is different by country and country regions; by religion and religious factions; and yes, by professions, companies, and teams. When we know which behaviors have a cultural origin it mitigates the feeling of offense. Present your note in the pile and see who else shares that feeling. A team can deliberately create its own rules of engagement – its own culture. Do it consciously and hold yourself to it. It will go a long way to getting the work done. Want to help the Women in Tech Retention project learn about corporate culture? Are you in your first tech job within the first 18 months? Help the Women in Tech Retention project learn about how well your college prepared you for success in the workplace. Sign up to help change our industry.